I enjoyed Epic's Hopulent enough last time I was in Colorado that I thought I'd try another Epic brew. Given that I'm on a bit of a saison/Belgian kick, this one caught my eye. It's part of release #9 (recall that Epic provides details of every single specific release of their beers). 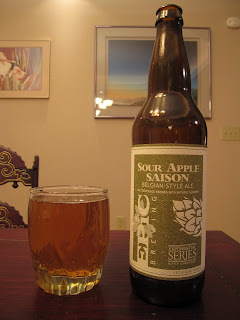 Now, I'm not usually one for fruity beer, but I figured sour apple flavors would complement the spiciness of a saison well- sort of like brett, but minus the funk. This looks exactly like a glass of apple cider. And as it sat in front of me while I wrote the first paragraph, I kept getting powerful wafts of the spices that they brew this with- cinnamon, nutmeg, cloves, cardamom, coriander, anise, grains of paradise...hell, why not just toss some fennel and szechuan pepper in there and make it a five-spice apple pie blend? There is apple in there too, but not in a tart kind of way- it's more like an apple Jolly Rancher. Combined with the potent spice aromas, it's pretty cloying. The flavor's much more tart than the smell, but damn are those spices strong. I would've appreciated a lighter touch with them, because they completely overwhelm most of the saison flavors. The apple does indeed complement what is there, and thankfully it's not Jolly Rancher-sweet; it's somewhat malty but quite dry, which is definitely of benefit, because if it was sweet it'd be almost unpalatable. There's a little bit of hop bitterness in there, but it's just sort of hanging out in the background. The finish isn't terribly pleasant because it tastes like I just failed the cinnamon challenge. Basically, this tastes like heavily spiced, slightly hopped dry apple cider, so I guess the first impression from the pour wasn't too far off. Aside from the maltiness and weak bitterness, it's almost unrecognizable as beer. And I just can't get past the spices- it has the same effect as someone wearing too much perfume (i.e. it's hard to notice anything else). I'd be much happier with it if they'd just not bothered with the spices, or at least minimized their impact, just to see what saison+apple would taste like...in my imagination, it'd taste pretty good. I hope that in subsequent releases they've found a better balance, because at least for this one they should've called it Christmas Spice Saison With a Bit of Apple In There Too.